You can accelerate your cloud migration using intelligent migration assessment services like Azure Migrate. Azure Migrate is a generally available service, offered at no additional charge, that helps you plan your migration to Azure. Azure Migrate discovers servers in your on-premises environment and assesses each discovered server’s readiness to run as an IaaS VM in Azure. In addition to Azure readiness, it helps you identify the right VM size in Azure after considering the utilization history of the on-premises VM. Azure Migrate also provides cost analysis for running the on-premises VMs in Azure. Additionally, if you have legacy applications, identifying the servers that constitute your application can become very complex. 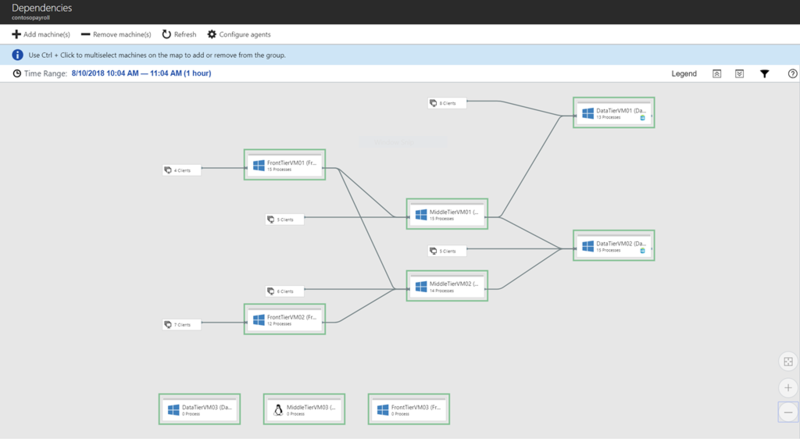 Azure Migrate helps you visualize dependencies of your on-premises VMs, so you can create high-confidence move groups and ensure that you are not leaving anything behind when you are moving to Azure. Azure Migrate currently supports discovery and assessment of VMware virtualized Windows and Linux VMs; support for Hyper-V will be enabled in future. When it comes to migration planning, every organization is unique and there is no one-size-fits-all solution. Each organization will have its own needs and in this blog post, I am going to talk about some of the new features added in Azure Migrate that can help you effectively plan your migration to cloud, based on your own needs. Here is a summary of the features recently enabled in Azure Migrate allowing you to customize the assessments to meet your migration needs. Reserved Instances (RI): Azure Migrate now allows you to plan migration to Azure with your virtual machines running in Azure VM Reserved Instances (RIs). Azure Migrate will model the cost advantages of RIs in the assessments. You can customize your assessment to include use of RIs by editing the assessment settings. VM series: The Azure Migrate assessment provides a new control to specify the VM series to be used for size recommendations. Each VM series in Azure is designed for a certain kind of workload, for example, if you have a production workload which is IO intensive, you may not want to move the VMs to the A-series VMs in Azure, which are more suitable for entry level workloads. 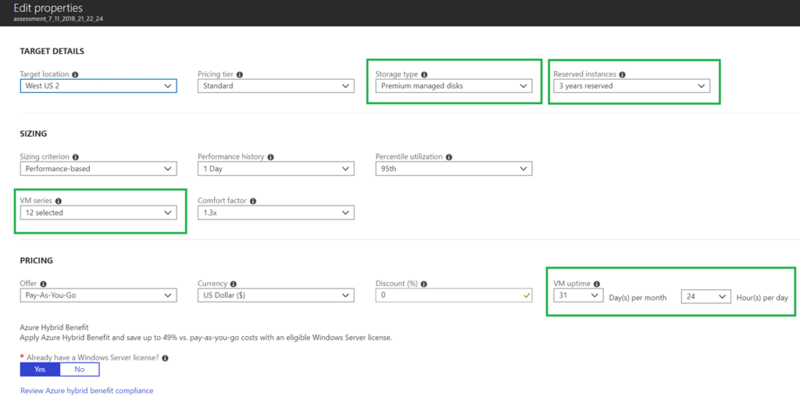 Using Azure Migrate, you can now apply your organization preferences and get recommendations based on your choices for the selected VM series. Storage type: Many organizations want to move their VMs to VM sizes in Azure that provide a single instance VM SLA of > 99.9 percent. You can achieve the same if all disks attached to the VM are premium disks. If you have such SLA requirements, you can use the storage type property in an assessment and specify premium disks as your storage type to ensure that the VM size recommendations are done accordingly. VM uptime: Not all workloads need to run 24x7 on the cloud. For example, if you have Dev-Test VMs that you only run 10 hours a day and only five days a week, you can now use the VM uptime property in assessment to specify the uptime details of the VMs and the cost estimation of running the VMs in Azure will be done accordingly. Azure Government: If you are planning to migrate your workloads to the Azure Government cloud, you can now use Azure Migrate to plan your migrations for Azure Government as a target location. In addition to Azure Government, Azure Migrate already supports more than 30 different regions as assessment target location. Windows Server 2008 (32-bit & 64-bit): If you have Windows Server 2008 VMs in your environment, you can now leverage the option to get free extended security updates by migrating these VMs to Azure. Azure Migrate will now help you identify such VMs as Azure ready VMs which can be migrated to Azure using Azure Site Recovery. With the enhanced features, Azure Migrate provides you a lot of power and flexibility to customize your migration plan based on your own requirements. Learn more about how you can customize assessments using Azure Migrate. Once you are ready with your migration plan, you can use services like Azure Site Recovery and Database Migration Service to migrate your workloads to Azure. Use the Azure migration center to learn when to use these services in your selected migration strategy. We are continuously improving Azure Migrate based on the feedback that we have been receiving from all of you. If you have any ideas or see any gaps in Azure Migrate, we would love to hear it from you. Use our UserVoice forum to post your ideas and learn about the roadmap. So, what are your waiting for, get started with Azure Migrate to begin your datacenter transformation journey!